Christ in Majesty, from Art in the Christian Tradition, a project of the Vanderbilt Divinity Library, Nashville, TN. http://diglib.library.vanderbilt.edu/act-imagelink.pl?RC=42443 [retrieved April 20, 2019]. Original source: www.mfa.org/. 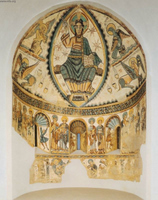 Spiritual Passage and Pictorial Tragedy in the Romanesque Frescoes at Vicq. Kupfer, Maria. The Art Bulletin, vol. 68, no. 1, March 1986.